As part of the Heron Watch (population count) team, we were assigned Admiralty Park and Sungei Cina to perform the count on 31st Aug 2013. As we were unfamiliar with that area, I decided to do a pre-watch survey "Heron Survey". Heron and Egret - none. A critical endangered plant in Singapore, and so glad that there are many of these plants in this park. Hailed for its medicinal value by local people, for treating the symptom of chicken pox (relieving of itch), to sore throat, as this plant produce a toxin called saponin, which is concentrated in the seeds. Saw these beautiful flowers on the ground. Closed Up of the yet to be budded flowers. Hanging so pretty on the stalk. With just their beaks, the weaver birds can construct such beautiful nests. Alas, I waited for hours, no birds were seen, and there seem to be no activities in the nests. The palms were fruiting, and came upon this one with flowers and fruits. The flowers remind me of the Anthurium! Maybe that is why there are no water fowls! Seemingly idyllic, but flowing in this water way are trash! Somehow this river is treated as a convenient disposal system! fogging (in the attempt to rid the mosquitoes, we also ended up ridding the good bugs and birds); remember the "good old day" of DDT, effective but cause much damage to the environment. and not too exactly sure what is keeping the herons, egrets and bitterns away! Perhaps it is the disturbance as construction is going on to widen the track; smell of tar is very strong; or there is nothing in the river to feed these water fowls, as the water is also polluted. Going to do another survey - and this time hopefully can see herons. 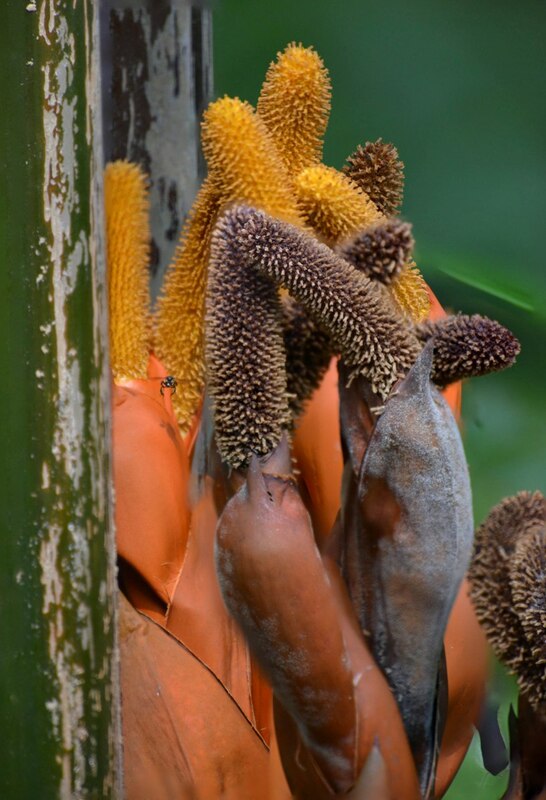 Hey Tiong Chin, the tree is Barringtonia racemosa, sometimes also called the Powder-puff tree. It's a back mangrove and freshwater swamp tree. Admiralty Park is one of the few places (the only one I can remember actually) in Singapore that they occur naturally. Thanks Ron for the ID. It is a pity that this species is only found in one location. Hopefully, it will thrive and spread.